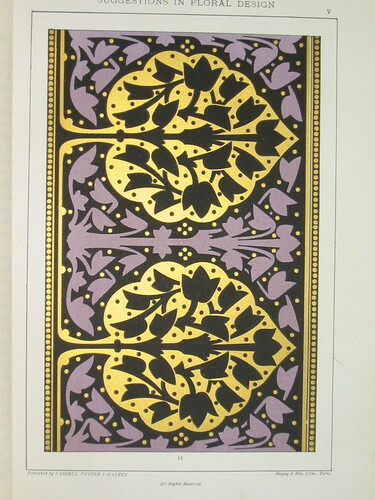 it seems to me that, when it comes to design, the victorian era is often overlooked. perhaps because it's so ubiquitous - in the uk at least. huge swathes of our towns and cities were built in the 19th century, a quarter of us live in houses built before 1919. and if we don't live in a victorian house, we've been accustomed to using victorian buildings all our lives, so much of our infrastructure - schools, hospitals, police stations, doctors' surgeries, etc. - is housed in victorian buildings. victorian flourishes and flounces surround us; mouldings, coving, glorious decorative tiling that often survives on hallway floors or fireplaces; all are commonplace. and familiarity breeds contempt. we only did away with the last of the surviving victorian interior aesthetic after the second world war, and not effectively like they did in the states. that dark wood furniture, those velvet curtains, those panelled doors, they lurked gloomily on for a long time. it's stuffy, it's fussy, it's the antithesis of modern, and we all know how much we love modern. even those who dig old stuff tend to go for the atomic, the mid century, or simpler, rustic, country style. everyone (except perhaps the crazy quilter) neatly sidesteps victorian, it just isn't cool. 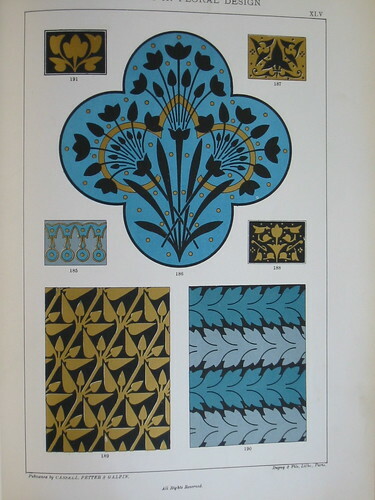 i can't say i'm any exception to the rule, but i do recognise that the more celebrated movements that grew out of the end of the victorian era - arts and crafts, art nouveau - had their roots well and truly in the victorian age. the modern was born out of the heart of the old fashioned. 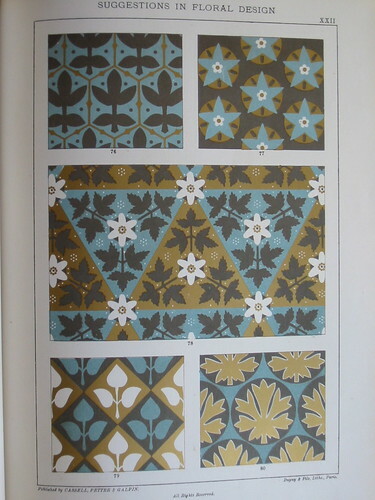 and i have a huge fondness for ceramic tiles, particularly victorian and islamic designs, which share a combination of botanical and geometric motifs, brought together with some kind of magic that must be specific to the medium (but to a degree is often echoed in textile design). and i've already shared my love of browsing for original sources. 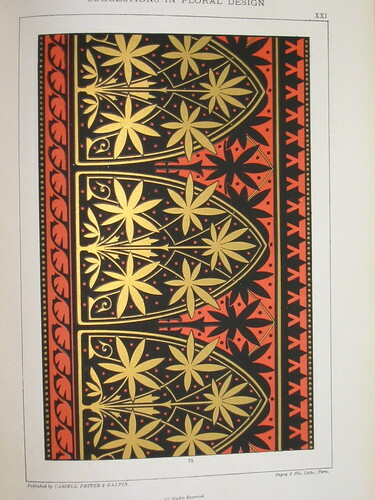 so when i found a copy of f edward hulme's suggestions in floral design (1878), a book that is apparently seminal in the development of art nouveau - most astonishingly - at a price that i could theoretically afford, how on earth could i resist? 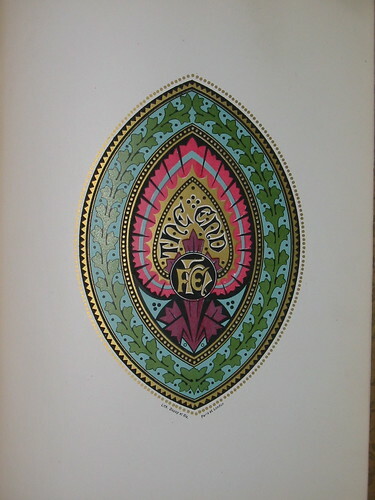 i haven't yet had a chance to read the text, i've been too distracted by the illustrations - crisp chromolithographs, many highlighted in gold. all astonishingly beautiful, and often surprisingly "modern". sadly i don't think i can afford to hold on to the book - i sank a chunk of my digital camera fund into the purchase, and i'm really aching to move on with that. so its stay with me will be temporary, but i've taken the chance to record all 52 plates while i have them, and put them into an inspirational flickr set. i'll try to annotate the pics as i work my way through the text. 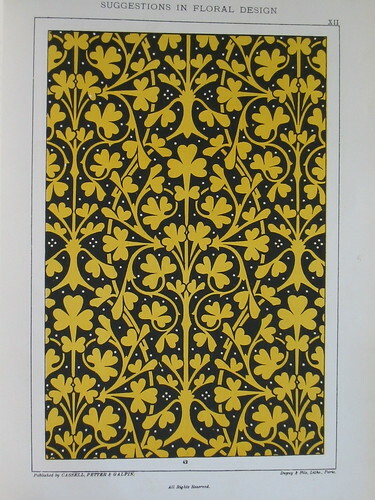 while it's not the same as the stunning originals, the good news is that the illustrations at least are available in reprint under the title victorian floral designs in full color, although i don't know whether the text is reproduced alongside them. 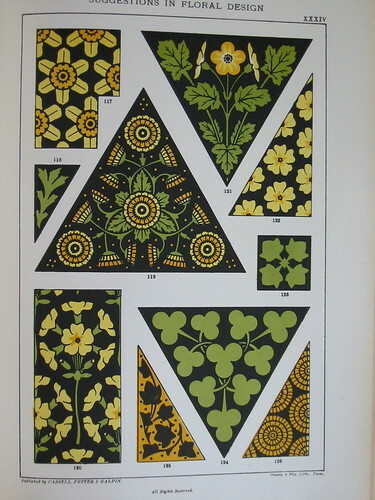 such beautiful designs couldn't have been developed without a thorough understanding of the subject matter, and f edward hulme is probably best known today for his series of volumes illustrating familiar wild flowers, pages from which are readily available as prints. if you're digging these as much as i am (heh, can you tell how much i dig them?) 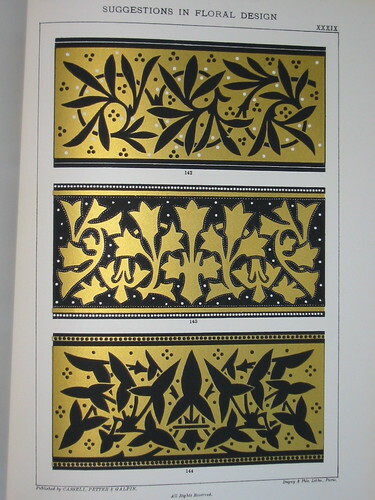 you might also be interested in christopher dresser's studies in design, from the same era, available in reproduction.